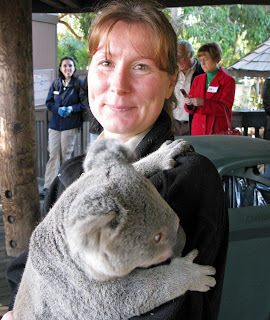 It takes a special koala and keeper to get this close to visitors. Kobi, a 2 year old male, is being trained by keeper Jennifer Mull to feel secure and protected while walking near people. We got this opportunity to help with the training, no touching allowed, on February 16, 2008 during a special behinds the scenes early visit to the zoo. This is the most “live wired” animal I have ever seen. Richard Schwartz, the keeper, said that Isa was probably the only leash-trained fossa. Isa was in constant motion during the entire presentation. These pictures were taken February 16, 2008, at the Children’s section of the San Diego Zoo. Zhen Zhen is our newest panda at the San Diego Zoo. Pictures were taken Jan 19th. She is 20 lbs. and headed up the tree. Baby pandas climb up the tree for safety coming down only when hungry and needing to nurse. Zhen Zhen started climbing a week before these pictures. The keeper is JoAnne Simerson.